Lock in a great price for Galaxy – rated 8.4 by recent guests! Pleasant smallish bedroom and nice modern clean bathroom, limited side sea view, fabulous buffet breakfast with nice home made goodies, the location is up a fairly steep path handily just on the edge of the village. Nice room with balcony overlooking the bay. Very clean. 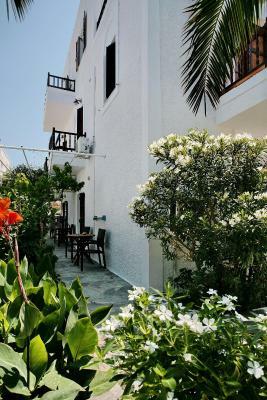 Stavroula, the host was wonderful - she upgraded my room for a little extra charge as I wanted to have a room with a sea view and she went out of her way to meet my needs. Cosy, clean, friendly. Pictures do not do it justice - it was so pretty. Location was perfect - just a few minutes walk to the centre and the beach. The bed extremely comfortable. The owner - Stavroula - was lovely and helpful for any advice. The first floor rooms and balconies have a lovely sunset view. I stayed on the ground floor, was quiet with a small garden. I really relaxed and enjoyed staying here and definitely would book again. Very clean and friendly place staff very helpful and always pleasant. Beautiful property! The common areas are gorgeous. Rooms are spacious. The staff were very nice. We would come here again. One of our best sellers in Aegiali! Only 650 feet from Aegiali Beach and the port, Galaxy is quietly located amid a small garden with spacious sun terrace and seating areas. It offers air-conditioned accommodations and free Wi-Fi in public areas. 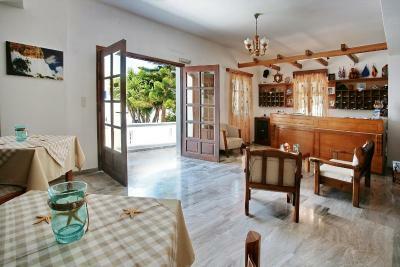 Fitted with iron beds, all rooms are airy and open to a balcony or patio with garden, mountain or Aegean Sea views. Each comes equipped with a TV, mini fridge and hairdryer. Guests will find shops and taverns within a short walk from Galaxy. The port of Katapola is around 13 mi away. Free 2-way transfer from Aegiali Port and public, on-site parking are available. When would you like to stay at Galaxy? Fitted with an iron bed, this air-conditioned room opens to the communal courtyard or to a balcony with garden or mountain views. It comes equipped with a TV, mini fridge and hairdryer. Fitted with iron beds, this air-conditioned room opens to the communal courtyard or to a balcony with garden or mountain views. It comes equipped with a TV, mini fridge and hairdryer. Enjoying Aegean Sea view from its private balcony, this air-conditioned room is fitted with an iron bed and includes a TV, mini fridge and hairdryer. House Rules Galaxy takes special requests – add in the next step! Galaxy accepts these cards and reserves the right to temporarily hold an amount prior to arrival. I ended up paying twice. I had prepaid in full months in advance but was charged also at the property after my stay and had to prove this to Booking.com who then did thankfully resolve this by refunding me as they could not get a response from the hotel. the internet in the room did not work during my stay but this turned out to be a bliss so I was not distracted from enjoying the nature and from immersing myself in the slow pace of the village life. All good. Great host! Great value for money. The bed is not very comfortable, it is a springs mattress. 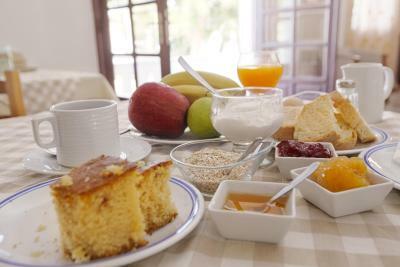 The breakfast is okay but the juice is not natural. The shower has no curtain so all the water comes out. The hotel is very nice! The room is big and location is great! WiFi wasn't worked. "Set of cosmetics" is two little soap. Stavroula was jolly and always available to help. Location is a plus, 2min walk from the waterfront! Garden is beautiful and ideal fro those that enjoy reading a book while enjoying a morning coffee.